The wreckage of the plane that crashed near Renco Mine in Masvingo. Cape Town — Three people are feared dead after a Cessna light aircraft they were traveling in crashed near Renco Mine in Masvingo, TellZim reports. 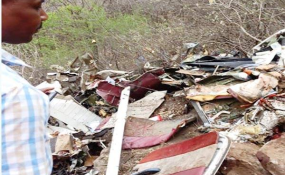 It is not clear when the plane crashed at Chemanjenjere Hills in the Tokwane-Ngundu area - but the reports doing the rounds on social media say police have already secured the wreckage - as they wait for the Civil Aviation Authority team to begin investigations into the cause of the crash. No registration details of the plane could be deciphered on the wreck, but the according to The Herald, it belongs to Executive Air Pvt Ltd of Harare. The deceased have not been identified yet. The tragic crash comes barely a month after a plane chattered by Air Zimbabwe developed problems mid-air only to be refused emergency landing in Bulawayo. The chartered aircraft which operates on the Harare-Johannesburg route was forced to return to South Africa where passengers were stranded on board for two hours.